I spent most of that afternoon (last wednesday) at the Canadian Blast party in the Brush square. Solid sets by Magneta Lane and Pilate. Swollen Members, not so great. They did have a great big tour bus, but I’m not sure the crowd appreciated the long wait in between them and the band before them. I remember having Tex Mex that night. One of the cool things about SXSW is that everything is so damn close. I ordered my food, left the table, went down 6th street 2 blocks, and caught two songs by Aberdeen City. They were great. And the food was waiting for me when I returned. After dinner I jumped across the street to see two songs from Sailboats are White and a couple songs from the Hot Springs. Could they be a new buzz band? They do hail from Montreal….. but apparently Edmonton is the new Montreal. A short hike then a couple tunes from Head Automatica. Then, the coolest thing happened. 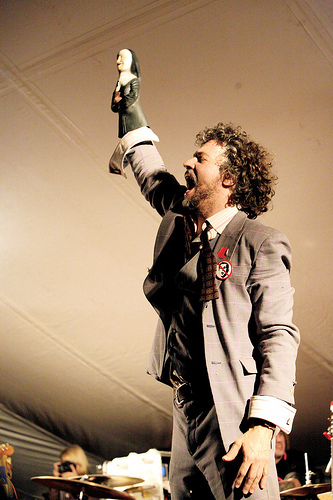 I heard that the Flaming Lips were performing a surprise set at a nearby outdoor venue. I missed their cover of Bohemian Rhapsody, but caught their rendition of Sabbath’s ‘War Pigs’ (with Peaches). Second last stop, Wolfmother. Last stop, and the best way to wind down the night? Mogwai. Purely awesome.